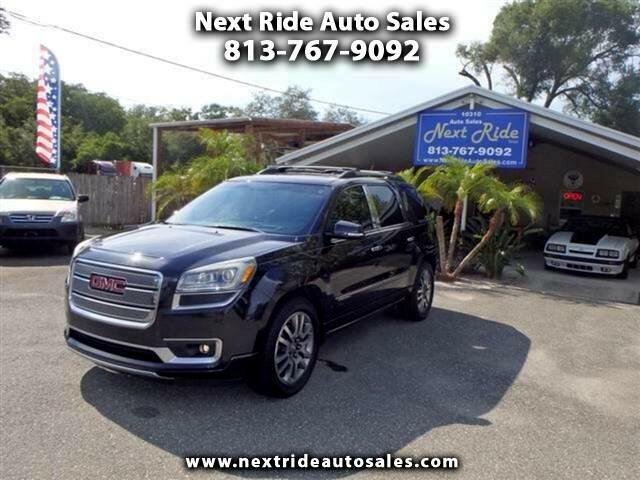 CLEAN 2 OWNER NO ACCIDENT NO SMOKER FLORIDA 2013 GMC ACADIA DENALI WITH DUAL SUNROOFS, NAVIGATION, BACKUP CAMERA AND SENSORS, REMOTE START, HEADS UP DISPLAY, BLACK METALLIC WITH WOODGRAIN TRIM WITH 4 BLACK LEATHER CAPTAIN CHAIRS AND FOLDING 3RD ROW SEATS, AUTO 3.6L V6 WITH ONLY 74,119 MILES GETS 24 MPG! BALANCE FACTORY WARRANTY *Powertrain 5 Years or 100000 miles, Corrosion/Rust Thru 6 years or 100000 miles, Roadside Assistance Program 5 years or 100000 miles. 2 KEYS, 2 REMOTES, OWNERS MANUALS, NEW 255/55/20 TIRES ON ALUMINUM DENALI WHEELS, NEW FRONT ROTORS AND FRONT AND REAR CERAMIC BRAKE PADS, NEW DELCO 48 MONTH BATTERY, NEW WIPERS, CHROME GRILL, MOLDINGS, DOOR HANDLES AND ROOF RACK, BLIND SPOT INFO, TECHNOLOGY PACKAGE, CAN OPERATE FROM APP, BOSE MP3 CD WITH IPOD/AUX, XM, HID HEADLIGHTS, FOG LIGHTS, DIGITAL INFO CENTER, BLACK LEATHER/ WOODGRAIN STEERING WHEEL WITH POWER TILT/TELESCOPIC TRIM AND CONTROLS WITH BLUETOOTH, CRUISE, OUTSIDE TEMP, COMPASS, ONSTAR, HOMELINK, DRIVER MEMORY, TOWING PACKAGE, DUAL EXHAUST, FLOOR MATS, POWER REAR HATCH, FOLDING MIRRORS, HEATED SEATS, WINDOWS, LOCKS, DUAL CLIMATE CONTROL WITH REAR A/C CONTROLS, BLACK LEATHER/WOODGRAIN SHIFTER KNOB, NEW SPARE TIRE WITH JACK AND TOOLS, TRACTION CONTROL, REAR DEFROST. REAL NICE VERY WELL MAINTAINED LOADED UP DENALI LOOKS AND DRIVES GREAT!